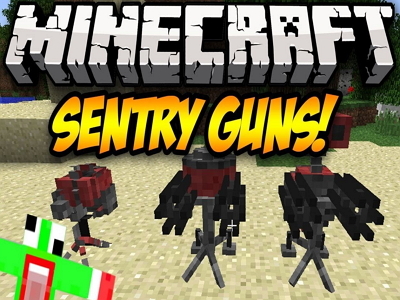 The Sentry Mod for Minecraft is a mod that allows you to create sentries to guard your home. Keep in mind that this mod only works if you also have Minecraft Forge. The sentries themselves have a variety of effects such as plant growth, wind effects against enemies, and the ability to drop arrows on enemies. Here are the different types and what they do. You will generally start by crafting tier 1 sentries but you can go all the way up to tier 4 sentries. The higher the level of sentry the more powerful it is and the larger the radius of its effect is. It also costs more to create as well but can be well worth it in some cases. The sentries themselves aren’t particularly complex looking. Essentially they are a small rectangular block that can be placed in various locations. They are color coded to give you an idea of what tier they are though. Crafting a sentry is very straightforward. They take six slots of blocks of a certain type combined with three slots containing other materials. The higher tier the sentry, the rarer the materials needed and the more of them you need.